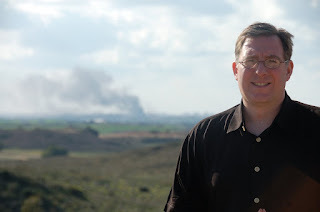 The picture to the left is author Joel Rosenberg on Gaza border on Saturday, January 9, 2009 following an Israeli airstrike on a Hamas target in Gaza City. I don't know about you but I am tired of people using scripture to justify all kinds of violence. Well, don't look now, but there's still new stuff being written to do just that. One of those authors who, whether by malice or mistake, has adopted a reading of scripture which has apparently helped Christians do something they should never do, i.e. justify or accept war and violence as a given, is Joel Rosenberg. I've only had a chance to read one of his books (Epicenter) which I found to be shabby scholarship at best and similar to the Da Vinci Code in its' strung together historical coincidences and proof texts. But I don't need to read much more to see how his writing has affected people. For example, I have heard Rosenberg quoted before to say that Genesis 12:1-3 (one of my favorite passages of scripture), particularly where it says "I will bless those who bless you and I must curse those who curse you", is justification for how the Israelis are treating the Palestinians and for their "plans" to attack Iran. One thing I can say about dispensationalism (which is Rosenberg's theological framework and hermeneutic of scripture) is that if you've read one book, you've read them all. And each book I have read in that vein, from Tim LaHaye to Joel Rosenberg, has fostered in people an overall complacency toward the violence in the Middle East, among all sorts of other things. It's all "prophesied" in the Bible, so why try to stop it... it's supposed to happen. This kind of complacency is something very other than Christian discipleship. It's true that God said to Abram that he would bless those who bless his people and curse those who curse them (and the Hebrew implies that he really doesn't want to have to do any cursing). Does that mean Israel should go to war with those who threaten them? As Christians we look to Christ to see what blessing and cursing really looks like. Christ said "blessed are the peace makers." He also said, "Blessed are the merciful" and "Blessed are those who are persecuted because of righteousness." So for Jesus blessing is for those who seek peace and even those who are persecuted for it. Who are curses for? Jesus, in Matthew 25, said that those who are cursed are the ones who don't care for the least of these, those who don't love, those who don't feed and clothe the hungry and naked..."Then he will say to those on his left, 'Depart from me, you who are cursed, into the eternal fire prepared for the devil and his angels." What else did Jesus day about blessing and cursing? Jesus said "bless those who curse you, pray for those who mistreat you." That's very different from going to war with those who curse you which is what Israel might end up doing and what the United States has done time and time again. God blesses by offering himself to his enemies and he curses by being cursed. If we don't believe that, then we might as well tear our New Testament out of the Bible. "Christ redeemed us from the curse of the law by becoming a curse for us..." (Gal. 3:13) We need to stop living as though Christ never came, as though death still has power, and we need to stop accepting it when death tries to claim authority. Jesus, the suffering servant, the ultimate peace maker, the oppressed who never resorted to oppression, is our only king and it's only by his life-giving power that we live and move forward. Be a peace maker!